In my previous Insights @ The Mill, I discussed which Projects Offered the Best Return at Hershey’s Mill. However, I did not disclose the Project with the Best Return on Investment. It is most certainly the Carport-to Garage Conversion. The Return on Investment for Carport-to-Garage Conversion is Greater than 200%. If the Return on Investment is so high for Carport-to-Garage Conversions, why are there so many Carports in these Villages? The reality is that these Garage Conversions are problematic. The vast majority of Carports are shared by multiple Homeowners. These Villages will not approve Garage Conversions without the approval of all of the Homeowners. To my knowledge, I believe am the only person to successfully accomplish a Garage Conversion in the past 5 years. A Successful Garage Conversion is Much More than Simply Adding a Garage Door. 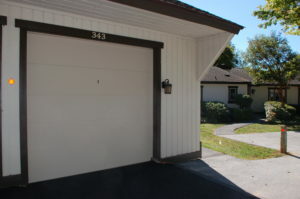 Coordinating with the Village Architectural Committee to obtain pre-approvals on the Garage Door Style, Finish & Color. The necessity of Adding Gable Vents to Ensure Proper Ventilation when the doors are closed. Permitting Approvals and Inspections from East Goshen Township. Coordinating with the respective Village HOA for Electrical Power for the Garage Door Opener since the Carports are typically served by a common HOA power circuit. Coordinating with Hershey’s Mill Landscape to modify the asphalt at the Garage Door opening so that the Doorway is level, drains properly, and does not cause any winter icing or trip hazards. One big problem is the Asphalt. It is just cost prohibitive to get any Asphalt Contractor to bring out the equipment needed and get a small load of Asphalt delivered. I was only able to accomplish this by scheduling my Asphalt work when Glenwood Village was having their Asphalt replaced. I am currently working on a program in Partnership with Winfield Garage Doors and Hershey’s Mill Landscape Division to offer multiple simultaneous Garage Conversions so that we can significantly lower the costs. I will keep you posted as we progress! !